In Japan, people sometimes eat green tea leaves. In that case, it’s usually exceptional teas whose leaves have been previously used to prepare tea. 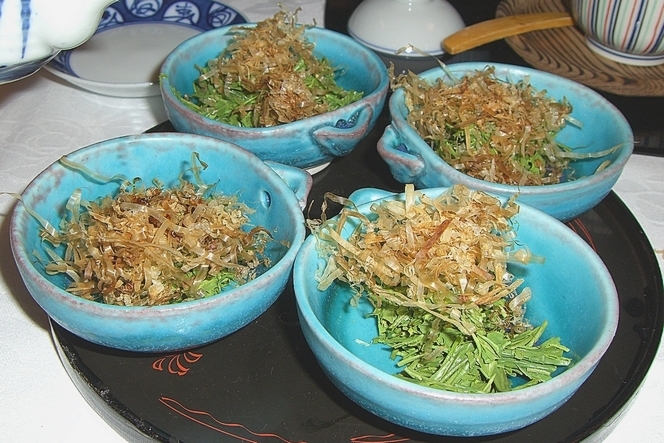 You can see how it is prepaped on the picture: after dropping the wet tea leaves into a container, you add skipjack chips and sprinkle a little bit of soy sauce over the top. It gives you a small tea leaves salad that’s absolutely delicious. Here, in Asahina (Shizuoka prefecture, Japan), the tea used is a great “Kabuse Cha” or “shade tea” manufactured by Mister Maeshima Tohei, one of the most well-known farmers of the area.